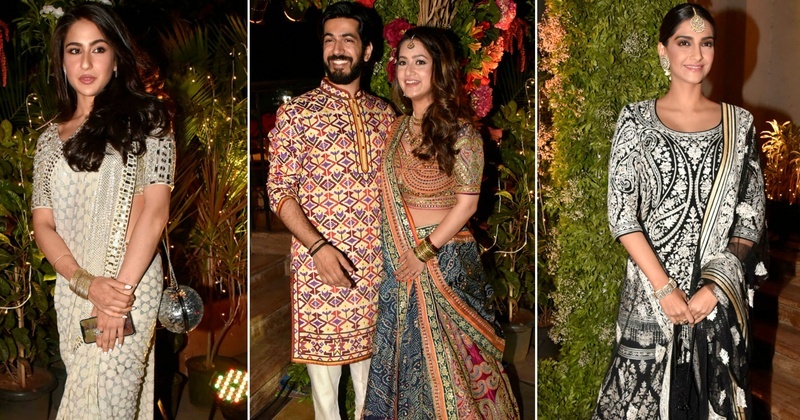 From Bachchans to Kapoors - who wore what at CEO of Abu Jani Sandeep Khosla's grand wedding affair! Saudamini Mattu - the CEO of Abu Jani and Sandeep Khosla label got hitched to a Delhi-based architect - Siddharth Bhandari and the wedding took entire social media by storm! Known to embody the spirit of AJSK, Saudamini’s wedding was nothing less than a big fat desi wedding! I am totally eyeing the bride’s magenta lehenga embroidered with lime green, peacock blue and tangerine threads. She draped an inky blue bandhani dupatta over her lehenga, adding more colour to her look and looked just stunning! As for the groom - Siddharth was spotted in a laid-back, but equally vibrant yellow, purple and red kurta paired with kohlapuris. Aishwarya was also one of the very few people who chose to pick another label other than Abu-Jani for the wedding. Like daughter, not mother. Dimple Kapadia on the other hand went all out with her look and I can’t help to be not stunned by it! Shweta Bachchan was on point with her summer-appropriate-dressing. Also, can’t take my eyes off that emerald necklace paired with an all-white attire! So, whose look did you like the best?